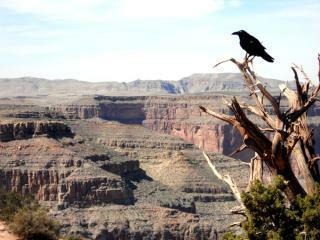 Located approximately 250 miles or 400km from the Las Vegas Strip, the Grand Canyon is considered one of the Seven Natural Wonders of the World and is a popular attraction for many travellers visiting Vegas. Helicopter and bus tours are available taking anywhere from a couple of hours to a full day and there are even options that allow you to take a boat down the Colorado River or head out on the 4,770 ft (1,450 m) horseshoe-shaped transparent cantilever bridge known as the SkyWalk. Blending vintage Las Vegas with all the wonders of modern technology, the Freemont Street experience is unlike anything else in Vegas. Home to some of the city's oldest and most iconic casinos, Fremont also offers the world's largest mechanical neon sign, cowboy 'Vegas Vic' as well as a range of live entertainment. Traverse the street in seconds via a zip line or marvel at the VivaVision light show and canopy featuring a 555,000-watt sound system and over 12 million LED modules. Located on the Neon Museum campus, the Neon Boneyard is a special collection of some of Las Vegas' oldest and most iconic neon signs housed in an outdoor exhibition space. 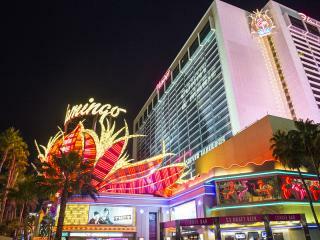 Home to over 150 historic signs including casino royalty such as Binion's Horseshoe, the Stardust, Caesars Palace and the Golden Nugget, the museum offers guided tours of this unique outdoor exhibit. 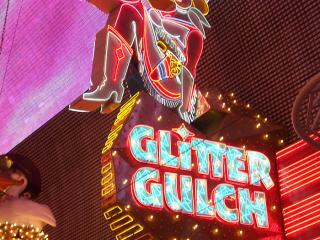 Discover the stories behind these glittering icons and Las Vegas through the ages. Originally owned by mobster Bugsy Siegel and named after his showgirl girlfriend's long legs, the Flamingo is now best known for its unique wildlife habitat home to, you guessed it, flamingoes! If you're feeling lucky choose from over 1,600 slot games, a poker room and table games like roulette, blackjack, craps and baccarat or the more relaxing keno lounge. If you feel like wasting away, Jimmy Buffet's Margaritaville features a relaxed island vibe with 220 slot machines and 22 table games. 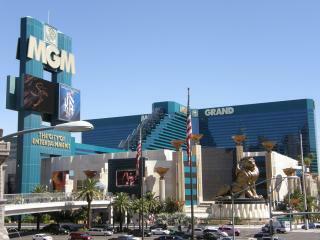 The second largest hotel in the world, MGM Grand is renowned for its appearance in the 2001 film Ocean's Eleven and features a classic Hollywood Art Deco theme. Offering the maximum gaming experience, the MGM is home to slot machines, blackjack, poker, sports betting, race betting and much more. Home to its own wedding chapel, there are plenty of other ways to spend your time at the Grand including one of the many shows featuring Cirque de Soleil, illusionists, comedy and more. Famous for its spectacular fountain and light show, the Bellagio is also home to a breathtaking Conservatory & Botanical Gardens featuring rare and equally gorgeous plants, flowers and trees selected from all over the world as well as the Fiori de Como, the iconic lobby boasting an 18ft ceiling with the most extraordinary sculpture of over 2,000 hand-blown glass blossoms. The casino also offers plenty of chances to try your luck on slots, table games, poker, race and sports betting and more. 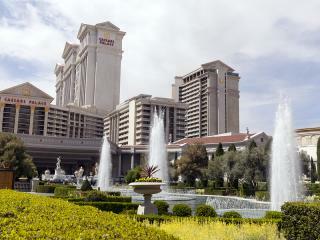 Renowned for its starring role in the 2009 comedy film The Hangover, Caesars Palace features an ancient Roman theme as well as some of the best casino games in Vegas including slots, table games like poker and blackjack, race betting, sports book bets and more. 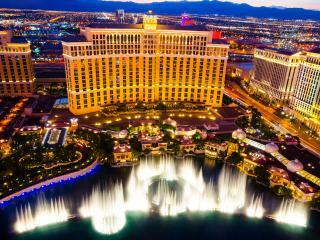 Boasting celebrity shows like Britney Spears and Celine Dion and a restaurant run by famous chef Gordon Ramsay, Caesars also offers unbelievable nightlife, iconic lounge Cleopatra's Barge and the famous Forum Shops. 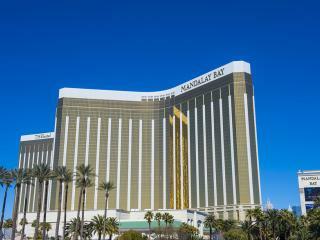 Featured in the 2007 film Ocean's Thirteen, Mandalay Bay is better known for its striking casino and amazing onsite attractions including the House of Blues live entertainment venue, the Shark Reef Aquarium complete with two walk-through tunnel-shaped aquariums and America's third-largest saltwater aquarium. Mandalay is also home to one very unique feature, an 11 acre beach complete with 2,700 tonnes of real sand, 100 rentable day beds, bungalows, cabanas and personal villas as well as a 6 million litre wave pool. This ancient Egyptian themed hotel and casino is iconically shaped like a pyramid but is best known for its Sky Beam, 42.3 billion candela beam of light that is the strongest in the entire world. 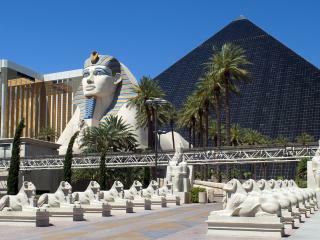 Known as a celebrity hotspot, The Luxor features a range of live entertainment including shows by the famous performance art trio known as the Blue Man Group as well as famous illusionist Criss Angel and many more. 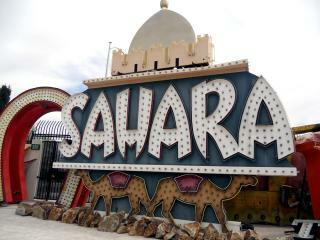 The 120,000 sq ft casino also offers high energy gambling, slots, table games and the party pit.